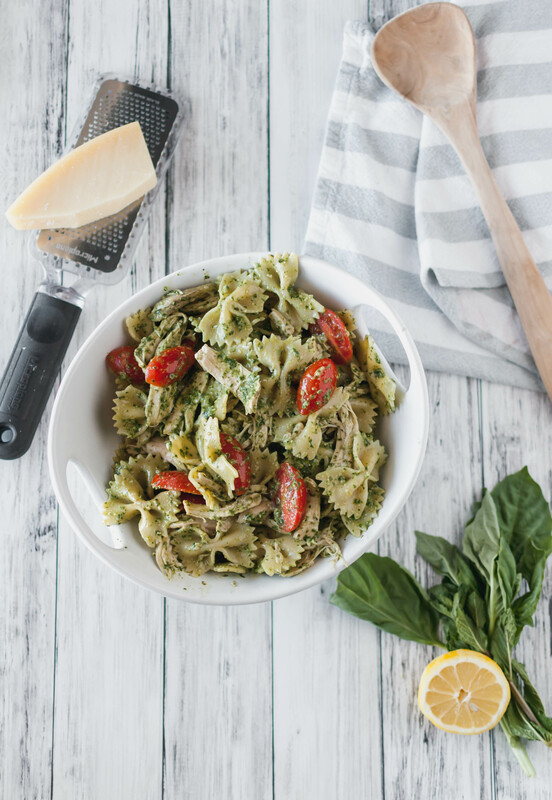 After a long winter, bring some bright, refreshing flavors to the table with this Lemony Mint Pesto Pasta Salad. I am so ready for Spring guys. These last few months have been long and cold and harsh here in Nebraska and I’m OVER it. I’m also ready for some grass in our yard so we don’t have to end up covered in dirt and dodge holes and hills as we play outside. It’s time for sunshine, t-shirts and chirping birds. Speaking of birds, we saw the coolest and funniest little birds in the pond behind our house this weekend and we were completely enthralled by their crazy, active behavior. We’d never seen them before so of course Wikipedia to the rescue and they were bufflehead ducks. They usually live on the east or west coast by the sea so these dudes must have been super confused and lost but we got a kick out of them. Maybe they were looking for a little cool weather while us Midwesterners are begging to go home with them. Maybe it’s a sign Spring is to come. Either way, Spring has officially arrived in my kitchen and it’s coming in hot with this Lemony Mint Pesto Pasta Salad. Mint and lemon two of my favorite flavors ever. They are both so bright, verdant and refreshing so I just had to do something with them after all the heavy dishes of winter. This fun spin on a traditional sauce is perfect tossed with farfalle (or bow tie pasta), halved grape tomatoes and shredded chicken. The addition of the chicken makes it really filling and turns it into a full meal all in itself. I used some rotisserie chicken because it’s delicious and keeps it simple but you can use leftover chicken from a previous meal or grill some up quick to throw in. It’s all good. I just adore pesto but don’t make it often since the husband is completely grossed out by it, #weirdo. It’s usually something I make in the summertime for lunches for the kids and me because they surprisingly like this green food. My previous favorite was always this pistachio pesto but it may have been dethroned with this one. It’s just so Springy and light and happy guys. I’m facing a dilemma now though, I have a ton of mint leftover so tell me what to make with it. All my brain goes to is mint chocolate chip ice cream, because it’s the best duh. Let me know how you love to use mint in the comments. Place basil, mint, lemon zest, lemon juice, walnuts, parmesan cheese and salt in a food processor. Process until fine. Turn on and slowly drizzle in olive oil until it comes together. In a large bowl, gently toss together the pasta, tomatoes and chicken. Drizzle in the pesto and toss gently until completely coated. Enjoy cold, at room temperature or hot.